Visitors to Colorado Springs can thank Julie and Spencer Penrose for their foresight and generosity in creating the area’s leading hotel, the Broadmoor, and five quality attractions. 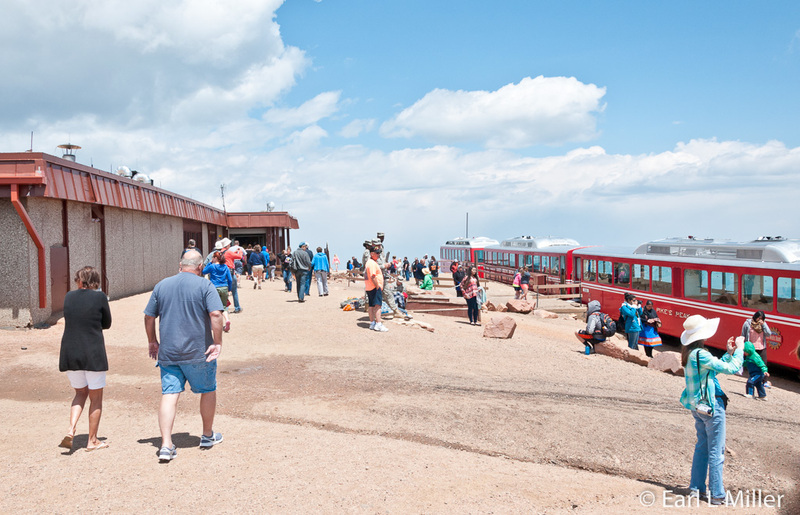 Pikes Peak Highway, The Penrose Heritage Museum (formerly El Pomar Carriage Museum), and the Pikes Peak Cog Train are interconnected as is the Cheyenne Mountain Zoo with the Shrine of the Sun. With this one and my next article, let’s take a look at all of these. 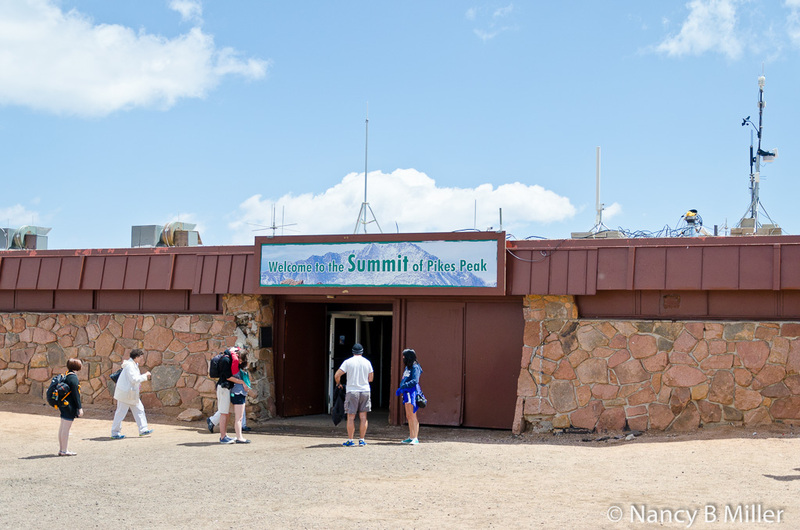 There are two major ways to reach the summit at Pikes Peak. 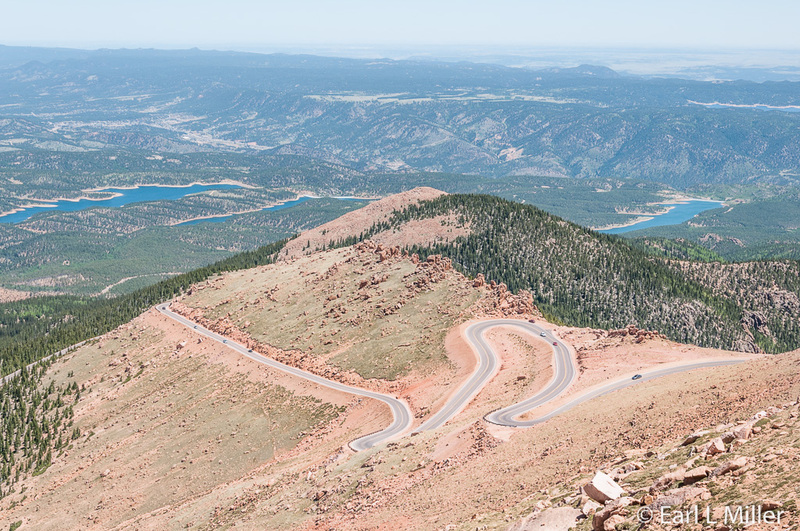 One is to drive the route while the other is to ride the Pikes Peak Cog Railway. Each has advantages and disadvantages. Whichever method you use, keep in mind that the mountain is 14,115 feet tall so it is best to spend several days in Colorado Springs before attempting your trip to the top. For those who don’t want to participate in mountain driving, the Cog Railway is a viable choice. Zalmon Simmons, founder of the Simmons Beautyrest Mattress Company, constructed it in 1891. He sold the railway to Penrose in 1925. Touted as the world’s highest railway in North America, the cog train’s round trip, on 8.9 miles of track each way, takes three hours and ten minutes from the time you leave to your return to the Cog Railway Depot in Manitou Springs. Those who travel this route have 30 to 40 minutes at the top to obtain a snack and explore the gift shop. There are no restrooms on the train. You must return on the same train. We have never taken the Cog Train preferring to drive the route. We saw and photographed the cars (Check out the 2014 web site header) when we were at the summit this year. The train, during the summer months, consists of two cars. The general impression of my group was that it appeared crowded, and you could smell diesel fumes from where it sat. It has two advantages. The conductor gives a narrated talk about the train’s history and facts of the mountain, the region, and how the cog railway was built. It provides another vantage point to view the scenery and, perhaps, wildlife, as is on the other side of the mountain from the highway. Reservations are mandatory with payment in advance. There are several rules about cancellation and pickup penalties which you should read on their site before booking your trip For example, you must arrive at least 20 minutes ahead to pick up your tickets or your seat could be forfeited if they don’t know you’ll be late. During the summer there are eight trains a day with many selling out. Rates are $36 per adult and $19.50 for children ages 3-12. Parking is an additional $5. Only food and beverages from the Cog Railway Market are allowed on the train. Their phone number is (719) 685-5401. Their site address is http://www.cograilway.com/. In 2012 and 2014, we took our time and drove to the Summit. The route was constructed in 1915 by Penrose at a cost of $283,000. His company, Pikes Peak Auto Highway Company operated it until 1935 when it reverted to the U.S. Forest Service until 1948. Since that time, it has been maintained by the city of Colorado Springs under special use format from the Forest Service. In 2012, the road became completely paved. 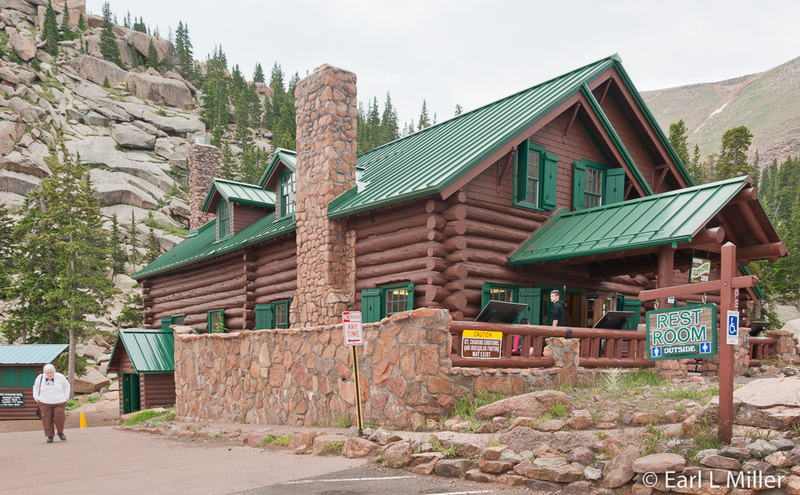 The drive was no problem for Earl, and it allowed us to make rest stops and read signboards at two locations, Crystal Reservoir, at milepost 6, and Glen Cove Inn, at milepost 13. These stops also allowed for us to take time for photography. 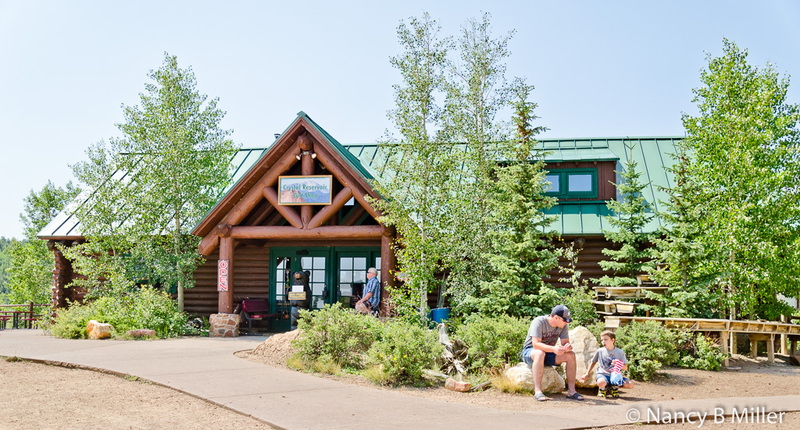 At Crystal Reservoir, you’ll find a visitor center, gift shop, and a self-guided nature walk. This is one of three lakes for fishing. 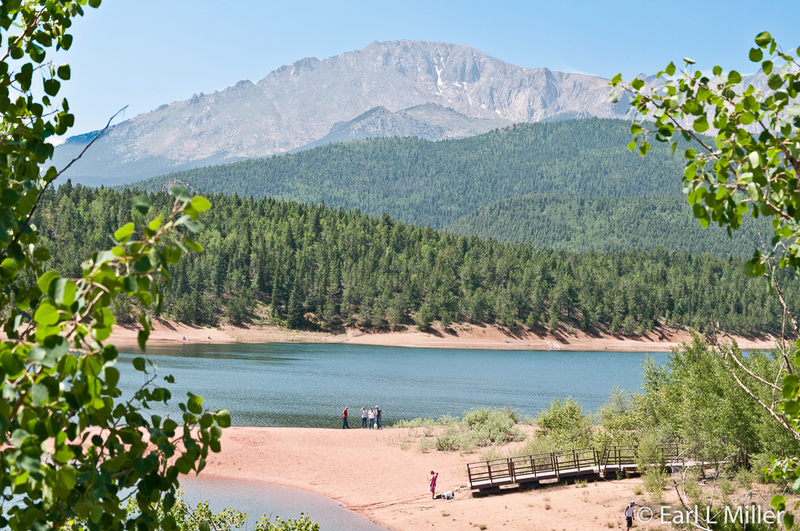 Its four signboards relate the use of the reservoir’s water, a match of your birding IQ to the variety of environments where they live, how the mountain was formed, and the former names of Pikes Peak. Pike, who never climbed the mountain, called it Grand Peak. It was then named James Peak, before its current title, after botanist Dr. Edwin James, who made the first recorded ascent. Historic Glen Cove Inn was originally a cabin settled by Frank Tweed in 1886 as a way station for travelers. Completely rebuilt, Glen Cove now provides a café and gift shop. 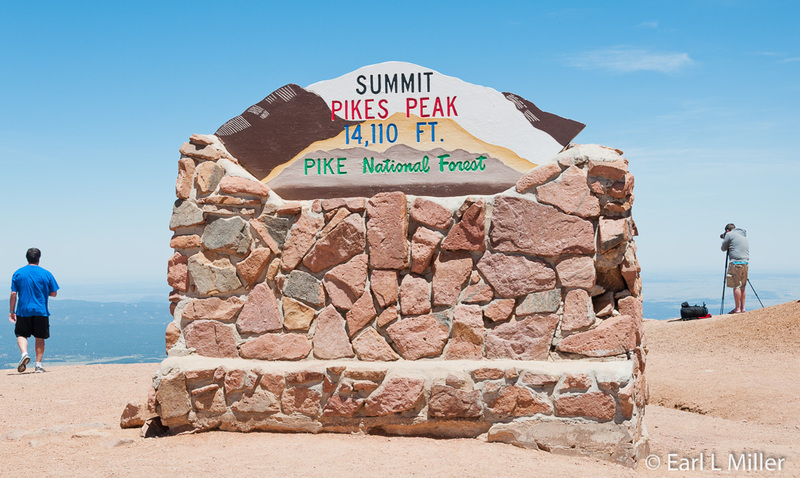 Its signboards provide information on the highway’s history as well as the Pikes Peak International Hill Climb. Picnic fans will enjoy the Halfway Picnic Ground between mileposts nine and ten. It has restrooms, tables, and several trails. At the mile post 18 pullout, you’ll see signboards about the Rocky Mountain Bighorn Sheep, Colorado’s state animal. On the summit, you’ll find the America the Beautiful monument and other commemorative plaques. You’ll want to enter the Summit House which contains a snack bar selling their famous doughnuts and their large gift shop. The best time to buy or use the restrooms is when the crowds are not there from the cog train. Otherwise, expect long lines. The trip is 38 miles round trip and takes two to three hours. Versus the cog rail, you decide how long you want to stay at the peak. Taking snacks and water in your car can be a real convenience. For safety reasons, it is essential to descend the mountain in lowest gear and not ride your brakes. Unfortunately, some people don’t realize this which can handicap your driving. On your descent, rangers at Glen Cove measure the heat of your brakes and suggest stopping for awhile if they are overheating. The cost to drive this road varies between winter and summer rates. From May to November 30, it’s $12 for adults and $5 for children ages 6 to 15. For up to 5 passengers, a carload rate of $40 exists. Hours are 7:30 a.m. to 8 p.m. with the last car allowed up at 6 p.m. To learn more, go to www.pikespeak.us.com. The older part of this museum, which Julie built after Spencer’s death, is loaded with their lifetime collection of horse-drawn carriages and motorized vehicles. Their collection was considered one of the largest west of the Mississippi. For 2014, a new wing dedicated to the Pikes Peak International Hill Climb was added. 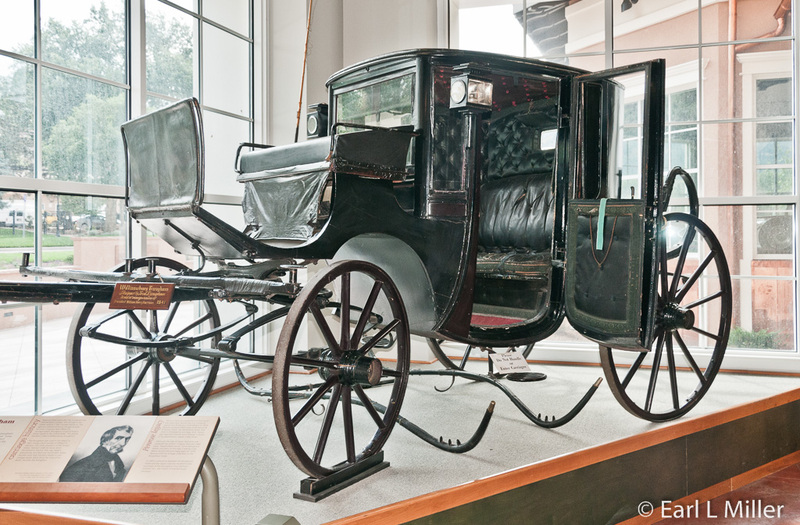 The museum’s oldest carriage is the 1841 Brougham, been called the Williamsburg Brougham, which appeared in William Henry Harrison’s Inaugural Parade. Harrison rode a horse that day instead of riding in the carriage. This was a major mistake as he caught pneumonia and died a month later in office. You’ll see an 1862 C-Sprint Victoria carriage which Penrose received from President Chester Arthur’s son, Chester Arthur II. It was purchased by this son in Paris. The 1896 Gentleman’s Phaeton was also owned by Chester A. Arthur II, who repainted it with the family coat of arms. Take time when you visit to check out the 1895 Yellowstone Sightseeing Carriage. It belonged to Buffalo Bill Cody. The carriage was used for sightseeing tours around Yellowstone. It was housed in the Broadmoor stables and brought out at 10 a.m. and 1:30 p.m. daily to provide rides for the hotel’s guests. Another car, a 1906 Renault Type AX, was owned by Charles A. Tutt Jr., the son of Penrose’s partner. You can’t miss the 1928 V-8 Cadillac Imperial sedan. This was an anniversary gift given to Julie Penrose by her husband. The chassis and engine were shipped to Paris for custom work. Hibbard and Darrin, in that city, built the body. Her initials are on the rear doors. After Spencer’s death, Julie never relicensed the Cadillac, which in nine years was only driven 16,000 miles. Another historic cart is the 1893 Training Cart owned by Jefferson Davis’s daughter, Margaret. She married Joel Addison Hayes who was president of the First National Bank. They settled in Colorado Springs in 1885 and their home is now part of Colorado College. Their daughter, Varina Davis Hayes, and her husband invested in several of Penrose’s projects including the Broadmoor Hotel. You’ll see three antique cars which have run in the race in this older section of the museum. 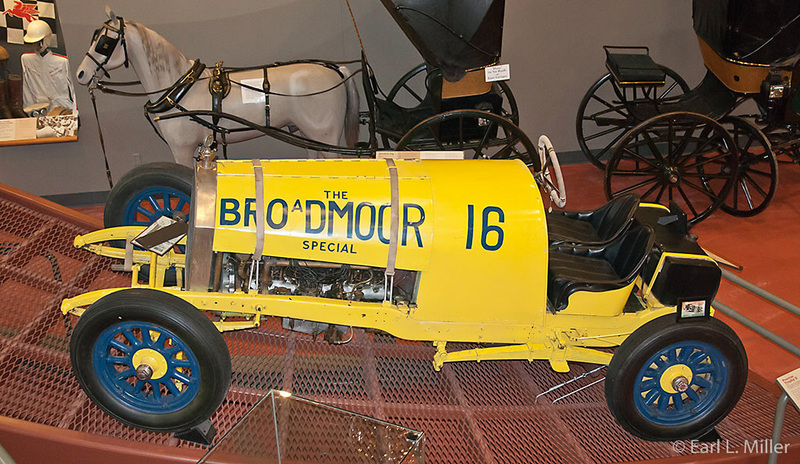 The modified Model T won in 1922. Otto Loesche powered the 1920 Lexington to victory in 1920 and 1924. 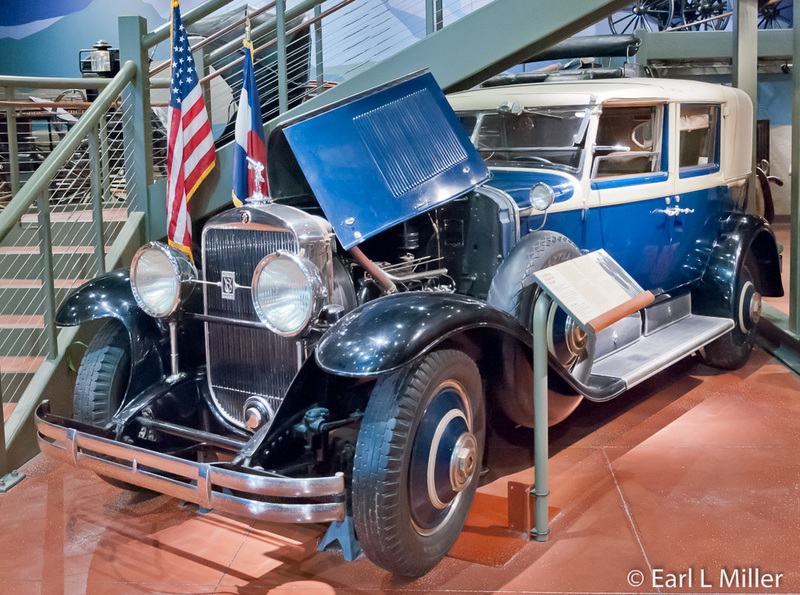 The 1918 Pierce Arrow nicknamed the “Yellow Devil” belonged to Penrose. It was modified from being a touring car to being in the race. His chauffeur and mechanic raced it between 1922-1932 with the best finish being fourth. Called the Broadmoor Special, it was clocked at 90 m.p.h. on the highway east of Cripple Creek, but it was clumsy on Peak curves. Downstairs you will find Charles Tutt’s large portable bank safe, and Penrose’s game table which was once housed at the Broadmoor Casino. Near the table is a 1937 wooden figurine from a cigar display at the Broadmoor Hotel Pharmacy. Take the elevator to the second floor. More carriages are upstairs and this is the place to take time to watch a movie produced by Spencer Penrose on Colorado Spring’s attractions. You’ll also see Penrose’s guns and Native American clothing. Penrose was initiated into the Sioux tribe in 1921 and given the name White Eagle by Chief Iron Bull of the Ogallala. You can see Mr. Penrose’s chieftain garment and headdress. In the new wing, there is a large amount of information on the Pike’s Peak International Hill Climb which started in 1916. It’s the world’s largest hill climb event and the second oldest motor sports competition in the U.S. - only Indy is older. The route is 12.42 miles long, has 156 turns, and gains 4,720 feet in altitude. The course has a seven percent grade. It’s a race to see who has the best time to the top of the mountain rather than directly against other vehicles. This part of the museum traces the time line of this race. It showcases the considerable advancements in aerodynamics, speed, and safety. The first winner was 22-year-old Rea Lentz. He completed his only race in 20 minutes 55.6 seconds. He received $2000 and the Penrose Trophy. In 1927, Penrose allowed the first stock cars. They raced from 1927-1934 then returned in 1956. In the 1970's, the truck division was added. During the 1980's, Audis and Peugeots were in the Rally Division. With the 1990's, vintage, exhibition, and electric cars also raced. Motorcyclists have participated as well. NASCAR fans may recognize the name Bobby Unser who won the Indianapolis 500 three times. He established 13 records in the 18 Pike’s Peak races in which he participated. Al Unser won in car #87 in 1964 and 1965. Jerry Unser won the first stock car division race, holding the title for 22 years. Louis Unser was in 36 races and was considered the “Old Man of the Mountain.” His last was at age 71. In all, 11 Unsers have participated in the Race to the Clouds. 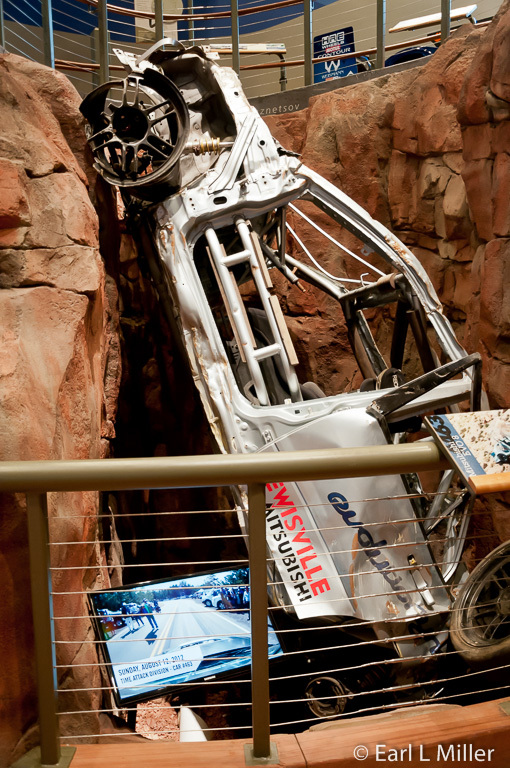 One exhibit is based on an incident that those following the 2012 race will never forget. Jeremy Foley and Yuri Kooznetsov lost traction with their Mitsubishi Evo on mile 16. The car went over the edge, flipping 13 times down the mountainside. No one expected them to survive. Due to safety and techology innovations, both walked away from the accident. The crushed car and a video of the accident are in this new wing. 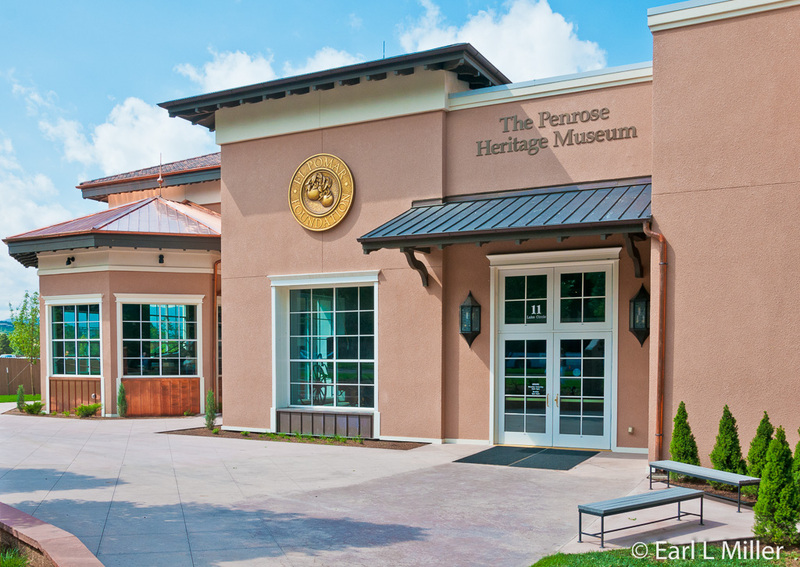 The Penrose Heritage Museum is located at 11 Lake Circle. Hours are Monday-Saturday 9a.m.-5p.m. and Sunday 1-5p.m. Guided tours are available upon request. Admission is free. Their phone number is (719) 577-7065. Park next door at the Broadmoor garage and have your ticket validated for three hours of parking. In the next article, find out about the Cheyenne Mountain Zoo, Shrine of the Sun, and the Broadmoor Hotel. 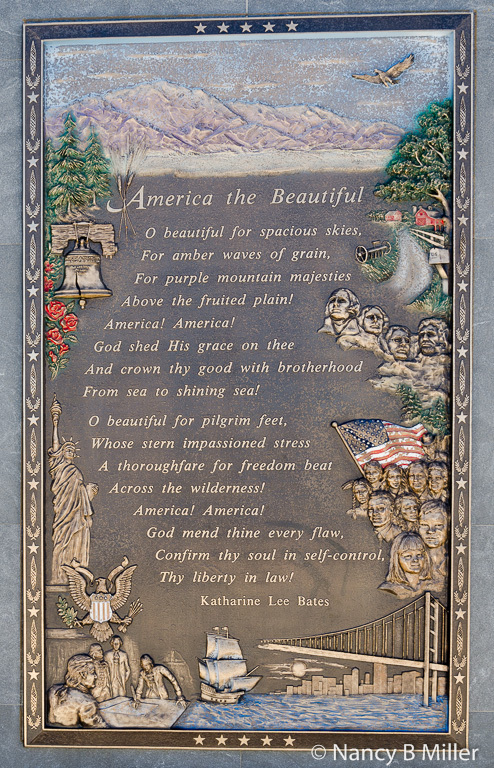 Katharine Lee Bates wrote the lyrics of "America the Beautiful". The music was composed by church organist and choirmaster Samuel A. Ward. Bates originally wrote the words as a poem, “Pikes Peak”, first published in the Fourth of July edition of the church periodical The Congregationalist in 1895. At that time, the poem was titled “America” for publication.